When words are not enough..
Simbolica Fair Trade is a sustainable brand of silver jewelry with symbolism from ancient cultures like the Mayans, Aztecs, Hopi and Maori. We also have semi-precious gemstones, known for their powerful effects. Symbols of friendship, love, forgiveness… for when you really have something to say. Our brand has been certified Fairtrade since 2005. All our jewelry is handmade in Mexico and Guatemala, using sterling silver. In the Netherlands as well as the rest of Europe, the Simbolica Fair Trade collection is sold in museum shops, New Age stores, third world aid shops (Wereldwinkel), and, of course, through this site. We are financially independent, which means we don’t depend on donations or subsidies. Making a profit is fine, but our financial goals are mainly to benefit our mission: broadening the social scope and making a big impact. Our team is small, but very committed and driven. We take great pleasure in designing, marketing and selling our products. We are continuously in direct contact with our producer s in Guatemala and Mexico, without any intermediaries. To us, this is the most efficient, pleasurable and transparent way to work. Every so often, we travel to Mexico and Guatemala to work on product development. Every producer has a unique development plan that requires attention. Two of our employees are permanently located in Guatemala to take care of logistics, among other things. 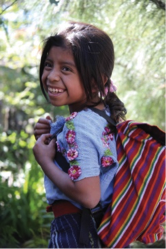 10% of our profits go to the schooling projects of the Simbolica Projects Foundation (www.simbolicaprojecten.net), providing hundreds of Mayan children with an education every year. 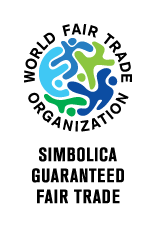 Simbolica Fair Trade is certified as a Guaranteed Fair Trade Organization. The WFTO Product Label indicates that the practices across the supply chain are checked regularly against the WFTO Fair Trade Standard through independent local audits. Every purchase of our products supports small producers and their communities.